The COUNT™ iCrease Pro + is a robust solution for creasing and perforation of digital media to eliminate cracking when folding. Get all of the automation of bigger COUNT machines in a simple hand-feed machine anyone can use. 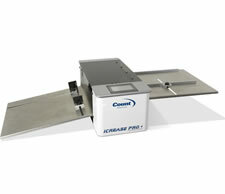 The iCrease Pro + can crease and perf in one pass (no need to refeed! ), with multiple crease locations and perfect bind covers, with choice of automatic hinge placement or no hinge. • Simple one-step hand-feed operation means anyone can use it. • Can crease and perforate in one pass – no need to manually refeed the paper into the machine after creasing. • Two-sided die creasing rod accommodates shallow or deep crease for different stock – simply remove and flip over to change. • Comes with pre-set crease locations for 11 different folds; plus 12 custom options to accommodate almost any fold. • Crease up to 12 locations and 4 perforations per page. • Switch from standard to micro perf in seconds – simply swap out the perf assembly. • User-friendly touch screen for easy set up and control of the machine.